NOTELike other shape tools, the Polyline tool creates pencil lines. Hence, its tool properties are similar to the ones of the Pencil tool and it can be used with pencil presets. NOTETo learn how to use the Polyline tool, see About Shape Tools. While the Tool Properties view only gives you access to the pencil size, a list of pencil presets and other drawing options, the Pencil Properties dialog gives you access to all the available options for your pencil's shape and texture. 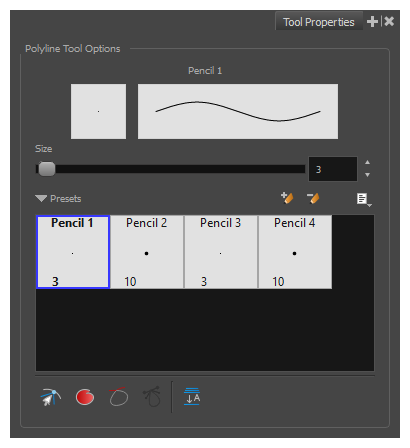 For more information on the Pencil Properties dialog, see the Polyline Tool Properties section below. Harmony provides a variety of presets and also lets you create and save your own. It is a good idea to create and save pencils with precise sizes and parameters when you draw and design for efficiency and consistency. All tools using pencil lines share the same preset list. Therefore, the Polyline, Line, Rectangle, Ellipse, and Pencil tools share the same preset list. Creates a new preset based on the current brush properties. Presets Menu Gives access to more options for managing presets. Allows you to import brush presets exported from Harmony. Allows you to export your brush presets into an .xml file. Small Thumbnail Displays presets in a grid of small thumbnails with a preview of their tip. Large Thumbnail Displays presets in a grid of big thumbnails, with their name and a preview of their tip. Displays presets in a list, with their name and a preview of a stroke done with each preset. This is the default setting.